I can say for sure knitting is the most popular craft in the world. 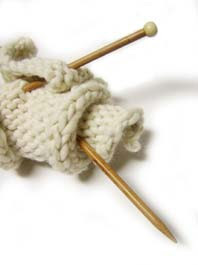 I was born in Romania, I can still remember very clearly how my grandma was knitting: very fast and daily. Then my mom: during dictator Ceausescu time she had to attend endless meetings with the same thematic: the glorious achievements of a great president: Nicolae Ceausescu. Actually nobody was listening, men were reading books and women were knitting discretely, with hands under the desks. At the end of a five-six hours meeting, everybody was showing happily what he/she accomplished: how many chapters in a book were read or a completely knitted sleeve…well, since then almost 25 years have passed. Now I am married in Turkey, and I can say that undoubtly Turkish women have amazing hands. They are so gifted, and they adore knitting and crocheting. Gorgeous items are knitted just for the sake of offering gifts or to decorate homes. All my lady neighbors are avid knitters. One of them, Fatma, is knitting a lot for her baby girl niece. When the knitting part is finished, she likes to embellish the knitted items with decorative stitches: cross stitches, looped stitches, etc using linen threads. It is amazing how a decorative stitch can change the look of a knitted sweater or vest. I strongly advise beginner knitters to try this very simple technique: if you don’t know (or don’t have time) to change colors and/or to knit laborious hard-to-follow patterns, just knit simple and then embellish with a decorative stitch using linen threads. For cotton yarns it is advisable to use ribbons for your decorative stitches.